Throughout its history, the British merchant marine often employed people from the same extended families, and it was not uncommon to have brothers or cousins working together on the same ship. Until now, however, relatively little has been written to provide an accurate account of the working lives of families and ships engaged in the ocean-going trade of the late 19th and early 20th centuries. 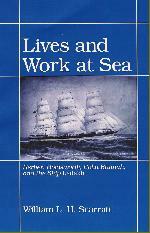 To help fill a gap in the literature, this carefully researched book traces the careers of two merchant mariners and a typical "tramp" sailing vessel of the time. Drawing upon government records, employment contracts, crew discharge papers, and other primary sources, the author presents a methodical yet altogether personal history, which is further enhanced by the inclusion of maps, period photographs, and memorabilia. Includes: 22 b/w plates, 3 maps, 80 tables, bibliography, index, and dust jacket.